I am done with buying things online!!!! except from my favorite stores. Lured in by perfect pictures, one tends to buy overpriced cheap products. For a blooming online retail sector in India, it's absolutely necessary to hold to customers faith no matter how ever small the amount of purchase is. Superior customer service and quality products would install faith in lost souls like me but, the sad part is :No is trying and everyone is taking the poor consumers like me for a ride. Iv written a post on Customer satisfaction here. And now for the story, I saw a FB mail from this lady, requesting me to check out her shop and I gladly hoped in to see if they have anything to be worth purchasing. I placed an order for 2 statement neck pieces on 1st Dec and made my payment on 4th Dec. I paid 730 rupees including a 100 extra for shipping. 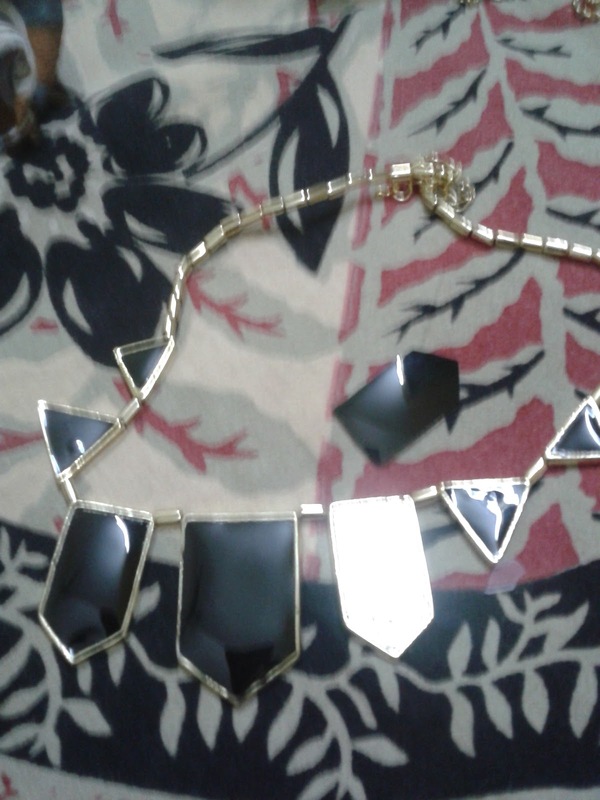 The day after I made my payment, my friend showed me an exact replica of the necklaces in ebay for under 5 dollar (Free shipping included) ie, max 250 bucks. This lady promised me that I would get my package before the end of week on 5th Dec.On 7th, she let me know that my order was dispatched. On asking for tracking id she gave me an excuse that as they posted in bulk she doesn't have the tracking id. After a near to break verbal dual with this lady finally my courier arrived on 13th. DTDC never takes this long (From prior exp). I came back home and was in for a rude shock. The plastic container in which the neck pieces was kept was broken and the packaging was pathetic. Adding to the fuel, one of the black thingy had come off. I paid freaking 400 bucks for a half broken, cheap looking Chinese made stuff?. I could with my money buy something useful. I mailed the lady with the image and she tried to offer help but, then with my engagement coming up and a tough time at work I have no time to heed to her lame apologies. I bought myself a feviquick on my way back from office and carefully stuck the black thing on and then strike two!!! the colour started coming off, thanks to the superb quality. I felt a rush of anger but, no one but moi has to be blamed for blindly trusting these blogshops. 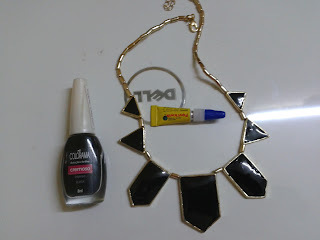 Finally, I decided to make use of my black maybelline nail polish. I carefully painted the whole black-white patched thingy black. Now they seem wearable. I have decided not to just buy random stuffs from random blog shops trusting these guys would only sell quality stuff. 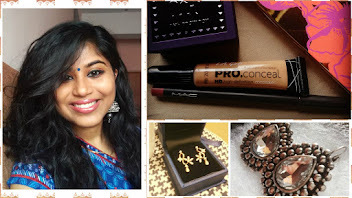 I am done with Online shopping for accessories for good!!! Aww thats really terrible. Thanks for the warning. I was always doubtful about these online stores and now am never going to try them, thanks a tonne for the advice. 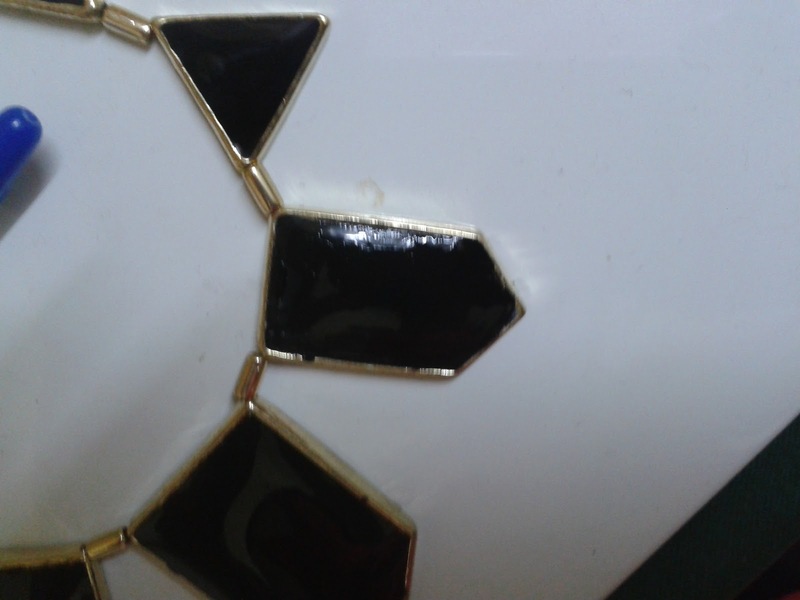 You know,you should come to Kolkata someday,you may faint at the ridiculously low prices of accessories. Kolkata will become your dream destination for accessory shopping,I swear. That is one horror story!! You should have sent it back and asked for a refund, although I admit you did do a good job with the repairs yourself!! Hey that was extremely frustating for me to hear,can imagine how you must have felt...Ever since I saw this neckpeice on several blogs I was drooling over it...lovely one!! Ohmigod this is scary !!! i always feel tempted to try out these so called blog stores..i think this is a lesson for everyone..will be extra careful when making my next online purchase..